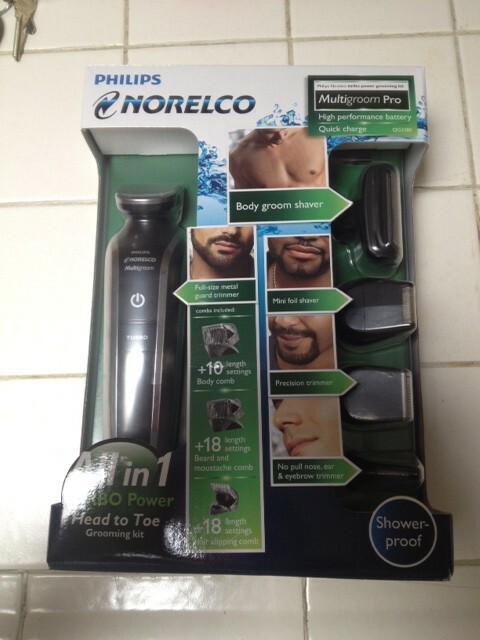 Philips Norelco Multigroom Pro: Perfect Gift for the Hubby! One Reader will win One! What to get the Hubby this year? Here is a great gift idea for you! The Philips Norelco Multigroom Pro is by far the best “groomer” that I’ve seen (and we have reviewed a few different ones!). I was sent this one a couple months ago for review and from my point of the view, the quality and solidity of this one was quite impressive. The razor and all of its parts were sturdy and did not feel cheap at all. The all-in-one grooming kit comes with a full-size metal guard trimmer, bodygroom foil shaver, body trimming comb, hair clipping comb, mini foil shaver, beard and mustache comb, precision trimmer, tube nose and ear trimmer, stand, cleaning brush, and deluxe pouch. Perfect for keeping everything in order and in one place too!! It did come with a tray too, but honestly that was a bit too plasticky for my taste, so it went in the trash. 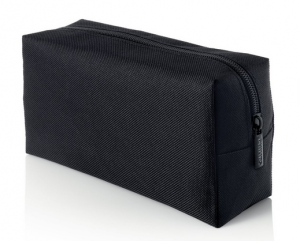 The pouch does the job perfectly to keep everything in order. The razor itself is the right tool for trimming, shaving and everything in between! It even has a nose hair trimmer! Nice thing is, Amazon actually has this one on sale too!! Marked down to $59.99 from $69.99 AND there is a coupon for $5 off!! Making this just $54.99! Perfect gift for the men in your life! ONE lucky reader (US only) will win this razor! Enter below using the rafflecopter. I need to buy 2 white elephant gifts for my husband’s side of the familys get together! Would like to win this for my husband. Thank you for the opportunity! Lots of shopping left to do. Would make a great gift for my dad! 3 more gifts! My mom, dad and brother. Then I need to wrap everything! My son or grandson would love this gift! I am finished, I think!!! My husband and the only gift my daughter asked for! I am double checking today but i think I am done with gifts. Just need a few small stocking stuffers and of course candy. I have one gift left to buy for a cousin. Just finished shopping for all the nieces and nephews on Saturday. Still have wrapping to finish. Nothing’s really left on my shopping list for the Holidays. Actually, I think the only person left if my boyfriend. How fitting! Everything. I haven’t even started! Eeek! All I have left to buy is a gift for My grandmother! A little groomer like this one is on my list! Good timing for a giveaway! I am still looking for airsoft items since my oldest son and his friends are into airsoft. I would absolutely love to be able to give this as a Christmas gift. It would be perfect !!! I have gift cards left to buy for my 19 year old daughter! I just have to pick up a couple small things to top it all off. Hubby would love this! Thanks!